This month's pattern replicates a beautiful Art Nouveau window that was originally constructed in 1890. Note the characteristic use of asymmetrical design and the use of opalescent glass that embodies the free flowing floral motif which is a characteristic element of Art Nouveau. It was my interest in the history of the 1800's that lit my enthusiasm for stained glass. 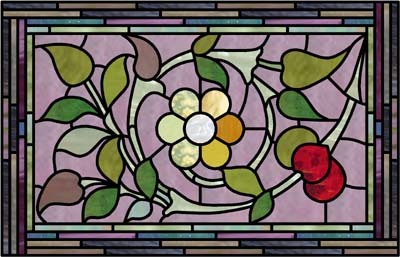 The elements of stained glass that drew me in are the powerful graphic design elements and use of color. Having an interest in antiques, I bought several antique stained glass windows for my home. I fell in love with the Victorian windows that encompassed hand-painted central medallions composed of floral elements and, very often, birds. This compelled me to do research on period design and led me to creating the "Legacy" series of authentic antique stained glass patterns. The Art Nouveau style of architectural design and decoration originated in Belgium and France as a major European design movement. Art Nouveau made its debut at the Crystal Palace in London during the first World's Fair held in 1851. This movement endorsed nature as the source of all good design. Design elements included stylized flowers created with flowing pastel shapes accompanied by the movement's signature motif, the S-curve, displayed as graceful or often dramatic whiplash curves. This fresh organic style influenced the design of fashion, home decoration, jewelry and furniture, as well as architectural elements worldwide. During the Art Nouveau period of the late 1800's and early 1900's there was a major advance in stained glass when American glassmakers expanded upon the European cathedral glass with the creation of opalescent glass. The addition of this milky soft glass significantly expanded the variety of glass available for artists. John LaFarge and Louis Comfort Tiffany were two American artists who first experimented with opalescent glass effects, which could produce lifelike shading and textural effects without the necessity of hand-painting the glass. Opalescent glass is a type of art glass, created by Frederick Carder (1863-1963) at the Steuben Glass Works in Corning, New York. Its iridescent appearance resembling the gemstone opal was accomplished by covering colored glass with a layer of colorless glass containing bone ash and arsenic. Because of the toxicity of the chemicals needed to produce opalescent glass there are only a few glassmakers still making it. Each of the Legacy pattern CDs has an assortment of authentic Art Nouveau period designs. You are invited to look through the Legacy pattern gallery and see if you can detect which patterns have the elements of Art Nouveau. A Michigan born artist, Jan Williams graduated from the University of Michigan with an Art Education degree. She has also obtained degrees in Graphic Design and Advertising Illustration, and in further studies she earned her Master's Degree in the Art of Teaching. You may send an email to Jan or visit her website to learn more about the fascinating world of historical stained glass design.